Data center pricing models have evolved, and continue to evolve, as we strive to price these big-ticket resources as efficiently as possible. In the wholesale market, leasing by the square foot gave way to capacity pricing that reflected power and cooling resources reserved for each specific customer. Metered power became the norm. Fixed costs for power allocation and use remain common by the rack. But in the wholesale market, use-based or "pay-for-use" pricing for allocated power and reserved cooling capacity is introducing a rapid delivery model, which reduces overbuilding, overbuying and overpaying. And it helps data center customers achieve operational savings over time. In a single capacity charge, inefficiency exists because a customer will typically require space and cooling capacity that they expect to grow into without utilizing the conditioned UPS power for some period of time. And very seldom, if ever, will a colocation tenant use 100% of what they are leasing. So in the traditional model, customers pay for the power capacity (i.e., much of the cost of building the data center) even though they are not using it all and most likely never will. Many factors - compute efficiency, technology refresh cycles, project delivery schedules and variations in the customers' business itself - contribute to changes in the IT loads that make those loads hard to predict. As such, they're likely subject to over-provisioning within multi-year contracts for costly data center facilities. This means it's important to find a colocation data center provider who offers transparency, flexibility and specific pricing of resources. A data center like that allows IT leaders to find significant savings by aligning space, cooling, UPS power, and pricing closer to their company's actual needs. 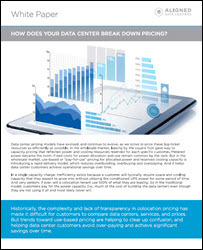 To Learn More about Data Center Pricing, download this white paper.